If the past several decades are any indication, and if current trends in global warming continue, the probability of more frequent and severe super storms will continue to increase. November 25, 2014—Hurricanes, typhoons, and cyclones have been familiar events in weather lore for a very long time. In the past several decades, a new weather event has entered the picture. This is the extreme ocean storm. The 21st Century has given rise to some previously uncommon events. One of these is the super typhoon. Summer 2014 is no exception. The Pacific Ocean is the largest of the world’s oceans. Because of its size, it is the scene of many cyclonic storms. The larger cyclonic storms are referred to as super storms. The term super hurricane or typhoon has been in use for 35 years and was coined by the US Military Joint Typhoon Warning Center. It was defined as a storm with sustained winds of over 150 mph (194km/h) for at least one minute. This is the most frequently used measure of a super storm, but not the only one. Super storms go by several different names, depending on where in the Pacific Ocean the storm occurs. Pacific hurricanes are those that occur east of the International Date Line and north of the equator. West of the International Date Line and north of the equator they are called super typhoons. In the southwestern Pacific and the Indian Ocean, they are called extreme cyclones. These super storms are more common in the Pacific and Indian Oceans than in the Atlantic. Storms in the northern Pacific normally begin to weaken if or when they turn toward the North Pole. While they occur someplace in the Pacific every few years, only three super hurricanes have been documented in the Atlantic ocean in the past century. The speed and size of a hurricane can be accurately detected by satellites. In the United States, a category 5 hurricane is defined as one with winds of 158 mph. Thus, a super hurricane is an upper category 4 or category 5 depending on the difference in wind velocity between 150 and 158 mph. However, one can argue that it does not matter which definition is used to describe a given storm, it is still a severe storm. Often with severe storms, instruments collecting data may be inaccurate or damaged because of the high level of wind speeds, with more accurate data available from satellite images. Super typhoons have occurred in each of the past three summers. 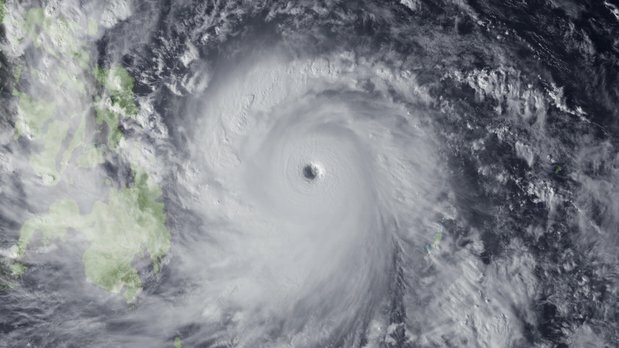 In 2013, Super storm Haiyan was believed to have had the highest wind velocities ever recorded in a typhoon. The Joint Typhoon Warning Center estimated the highest sustained winds for one minute reached 195 mph (315 km/h). Another agency estimated sustained winds for a 10 minute period reached 170 mph (275km/h). Gusts reached 235 mph (378 km/h). Due to the path it took over the Philippine Islands, the storm took more than 8000 lives and did a tremendous amount of damage. A number of other recent typhoons have nearly reached the category of being super-typhoons. These include Genevieve, Jelawat, Ramasson, and Vongfong. Typhoon Vongfong in October was the strongest storm on the planet in 2014. Wind gusts were recorded at approximately 195 mph. The eye of the storm was 26 miles across at its peak. The storm may have reached category 5 on the Saffir-Simpson scale for a short time. Categories: Climate Change, Extreme weather, Global warming and its effects on animal population, typhoons and cyclones | Tags: Climate change, cyclones, Extreme ocean storms, Extreme Weather, Hurricanes, Super Hurricane, Super Typhoon | Permalink.